Powered with thick padding layers, the gloves are exclusively for bag and mitt work training and offer a comprehensive protection especially on fingers and knuckles. The wrist support might be not strong enough but can be compensated with a hand-wrap underneath for extra safety. 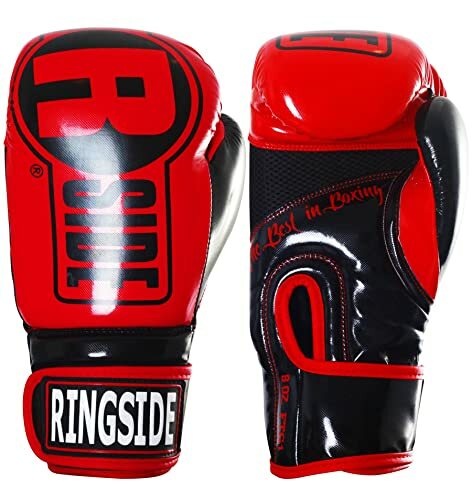 The low price, along with a wide color selection, makes these Ringside Apex gloves ideal choices for beginner trainers. Stay-dry lining, along with well-ventilated palms and thumbs, allows comfortable, dry and breathable hands and avoids bacteria. Made with the new technology called Injected Molded Foam (IMF), the gloves has 2-inch padding foam directly implied to the gloves by a machine, formulating to absorb and diffuse the shock when user throws a punch. It feels snug fit on hands, constructing an effective safekeeping especially to fingers and knuckles. The hook-and-loop (Velcro) design allows users to quickly break in and off in a few seconds. However, the downside is lack of great stability and extra tight holding around the wrists. Using a hand strap before putting the glove on will add more necessary support, especially when you get ready for a hard strike. Notice that it is not advised to use this Ringside Apex for sparring but solely for mitt and bag work. Made from PU leather, the glove doesn’t provide such a strong and pro-longed resistance as the one made with real leather. But,despite all the tough strikes and punches you throw with this bag glove, it will fairly last an extended time for what you pay.